Delta/alluvial fan at the confluence of the ??? and ??? Rivers, near Demchock in a region of the Himalayas disputed between India and China (and Pakistan?). There appears to be a series of springs within the alluvial fan, the location of which marks the surface trace of a major NW-SE trending (thrust?) fault zone.Wow, that was a challenging one! WoGE #66 is posted.P.S. I enjoyed #65 thoroughly (in retrospect). Thanks Zoltán! Ron, I am happy that it was challenging even for you :). 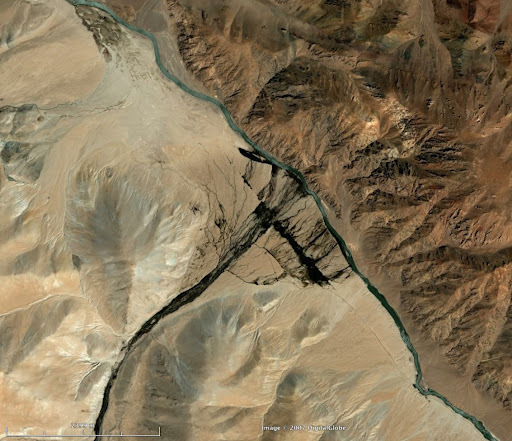 The fault is the Karakorum (or Karakoram) Fault, a right-lateral strike-slip fault with a 250 km offset that accommodates part of the northward movement of India. The river – surprisingly enough – is the Indus river, which flows for hundreds of miles to the northwest across Kashmir (the disputed region) before turning to the south to flow through Pakistan, and ultimately delivering sediment to the Indus Fan (turbidites had to be in the story somehow 🙂 ). Kashmir is indeed disputed between Pakistan, India, and China — it’s quite a mess. I have learned these things only recently, but that’s why this game is worth playing. Thanks for the suggestion for P.L. (the same geologist who found WoGE #66).